JP Morgan would not identify specific platforms that it tracks in its account database. But they are likely to include Uber and Lyft and the household helper website, TaskRabbit, where individuals sell their handyman, cleaning, or errand services – JP Morgan calls these “labor platforms.” Examples of “capital platforms,” where goods are sold, are Airbnb, eBay, and the fledging Darkroom.Tech, where photographers can sell prints of their work to social media fans. In any given month, about 1 percent of the people studied use them to make some income, and more than 4 percent have used them at one time or another. Low-income workers and people who do not have steady employment are more likely to sell their services online. This also holds true, though to a lesser extent, for people selling goods. The study observed the payments received in a customer’s bank account from 42 different platforms, which charge a transaction or subscription fee to act as the seller’s intermediary. So it didn’t include free platforms like Craigslist, where buyers and sellers transact offline. Several findings in the study support Greig’s contention that the platform world is comprised mainly of part-time jobs. 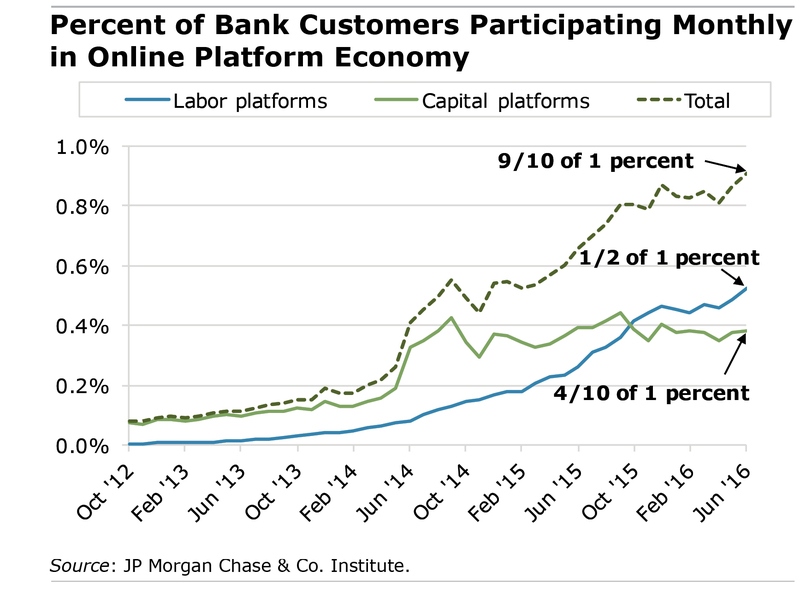 The platform economy is still growing. But the flow of new entrants has slowed in an era of near-full employment, and there is significant turnover – more than half of the people who try a platform leave within a year. When “a larger and larger proportion of participants have a traditional job, the opportunity cost of working on the platforms is now higher,” Greig said. Established users typically generate only about one-quarter of their annual earnings this way – in other words, supplemental income. Lyft seemed to corroborate this, saying its data show that the vast majority of its drivers are on the road less than 20 hours per week. After all, the only thing predictable about the online landscape is that it never stays the same. But how will future changes affect workers?